Do you wonder how a one-year-old kid can easily navigate a touchscreen smartphone even before actually knowing how to read? Some parents find it harmless to have the TV or an electronic gadget as an alternative source of entertainment for their young children. However, recent studies show that over-usage of electronic gadgets, especially without parental supervision, has negative effects on the health and development of children. Younger children, toddlers in particular, have a very active brain activity. This is the time they explore new things, interact with other people and learn a lot about themselves and their environment. If they are engrossed with gadgets, it could have detrimental effects on their development. In the old days, toddlers are often seen at nearby parks, playing around, laughing and creating happy memories with other kids. When you compare it today, a two-year-old may spend most of her days indoors watching online videos, playing downloaded applications or streaming the whole episode of her favorite cartoon show. By the age of three, toddlers are often introduced to preschool activities like scribbling shapes and lines, and recognizing letters, sounds, and colors. Nowadays, there are a lot of educational apps created to help children learn them too, which is good. However, the difference is that toddlers simply swipe and press things on the smartphone/tablet rather than use their hand muscles to grasp an actual pen and practice writing. The voice prompts from the educational apps often tend to promote passive learning, meaning, toddlers may just wait for the commands coming from the gadget rather than actively think of what they could create by themselves. A toddler’s favorite evening show or YouTube video may directly affect her way of communicating with other people, including her parents. Are you worried about how your three-year-old talks back to you or how he/she speaks with other kids? Try streaming the show or video that he/she often watches and you’ll find the answer. Starting at one year of age, children already develop linguistic abilities and at this stage, parental supervision is very crucial. What they learn during the early years will be reflected in the way they communicate in the future. Your toddler will love to have his/her own space in your home. A mini table and chair which is just his/her size are definitely a good investment because these mini furniture pieces would increase his/her interest in the other forms of entertainment like reading and scribbling notes. To complement with the mini furniture idea, add some eye-catching storybooks, colorful pens, coloring books and paper. Arrange them neatly on the table or in an area adjacent to it. Well, it wouldn’t end up neat after your little child uses it, however, he/she is sure to become more interested in these reading and writing materials if they are readily available in his/her table. Parents of toddlers would agree that these little kids love to explore and create new things. So to take his/her attention away from the electronic devices, you can try tapping into his/her artistic side. Colorful play dough can be a good way to start. Play dough will definitely catch a toddler’s attention since it has vibrant colors with a soft, easy to mold texture. It will enhance a toddler’s imaginative and creative skills, too! For an older toddler, three years old and up, you may also introduce the use of craft scissors. Just make sure that the scissors are safe for young kids and the size is small and handy enough for those cute little fingers. Non-toxic, colorful poster paints are great for older toddlers as well! Just make sure that an adult is supervising them while they do their arts and crafts project. You can also join them! It would be fun, and at the same time, a great way to bond with your little one. Admit it. With today’s busy schedule, you may not have an extra hour to spend reading bedtime stories to your kids. However, if you wish to have a good reader, you must first have a good listener. Listening to bedtime stories instills the idea of reading books to the minds of younger kids. When you read to them, you develop their imagination and their interest in books starts kicking in. If you are a busy parent, spending a couple of minutes reading to them during your days off wouldn’t do you any harm. It is also important to note that reading a storybook is different from offering them a storybook on a tablet or the TV. Bedtime stories are interactive and much better since children can readily ask you questions and give their insights about the story line. Whereas when they use electronic media, they are stuck with what is available, and worse, if left unsupervised, they may click on a video that is not suitable for their age. Almost all parents can relate to problems with scattered toys. Sometimes, to get rid of the mess, you may have the tendency to hide the toys rather than allow your little child to play with them. It is understandable, however, how will the child shift to playing toys when they aren’t even available in the first place? Keeping toys in an area accessible to your little child will promote his/her interest in them. An easy-to-open toy container or an open toy basket made of durable plastic would come in handy. If you’re too tired of the mess, gradually introduce the idea of cleaning up. Toddlers love to mimic adults so if they see you shooting those toys in the basket, they will be encouraged to follow suit. Creative toys are encouraged rather than the battery-operated options. Why? Try to observe your little one. If you give him pieces of blocks, he would start grasping, sorting and building things out of them. On the other hand, if you offer him a battery-operated dancing robot, he will just sit around and watch the robot move all by itself. He may also want to take and have a closer look at the robot, but admit it, we are guilty of preventing a child from doing so since it will damage the robot. Can you see the difference? The former promotes more interaction and active participation whereas the latter promotes passive entertainment. Creative toys would encourage your son/daughter to become more involved in playing and this will enhance their critical thinking and imaginative skills. As much as we want to give a hand to our little one, resisting it could play a major role in the child’s learning. Toddlers are at a stage when they are learning their autonomy and this is an essential developmental milestone for them to accomplish. Too much help would result in too much dependency and we wouldn’t want that for our kids. So what shall we do? Allow your toddler to have some self-directed play – let him/her handle stuff and explore their capabilities. If your son can’t open the toy box but you can see him trying, let him handle it. If your child doesn’t ask for your assistance, he is more likely to be confident that he could accomplish the task by himself. This would promote autonomy as well as boost the confidence of your child in performing more complicated tasks later on. Sometimes, the problem with us parents is that we tend to disrupt our kid’s playtime. It is important for parents to learn that play isn’t just a pleasurable activity for children. They are actually creating a very important project and their brain activity is at its best. Without our knowing, interrupting them often would affect the way they perceive the idea of the play itself and think of it as unimportant. Sparing a couple of hours just for play is a mindful idea. Give your child ample time to discover new things out of his toys and offer him time to play with other kids in the neighborhood. Also ensure that your toddler is well fed and hydrated before playing so as to avoid interrupting the play schedule. Upon reading this article, you might become too excited to offer your child several toys all at once. Yes, you may have a lot of resources for a wide variety of toys, however, offering them too much may exhaust them. 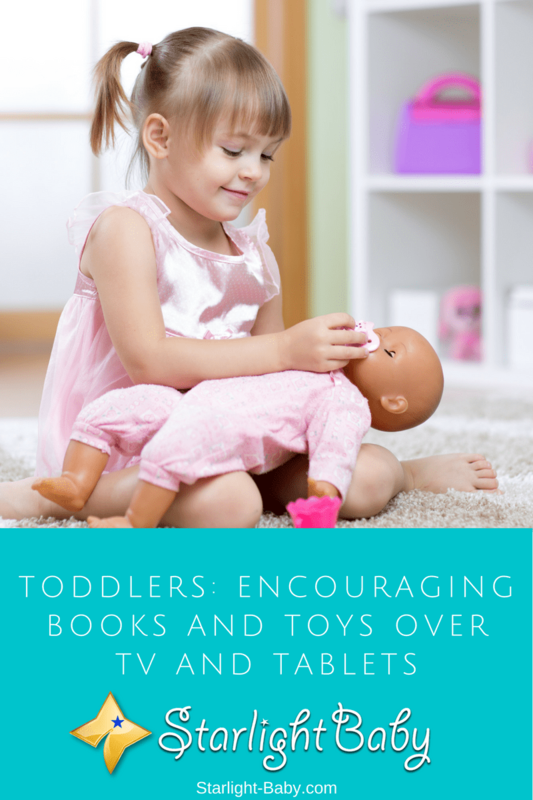 Toddlers often tend to focus on one toy at a time, so let them be. Their attention span is very short and you can let them shift to another toy when they already want to. Lastly, an important factor to encourage play in your toddler is to trust him/her. Allow your child to choose and decide which toys and what type of play he/she is more interested in. If your child is fond of cars, let him play with toy cars. If your daughter is more interested in cooking, allow her to play with a kitchenette. As long as you ensure they have healthy options, trusting your toddlers with their choice is good and will help them have good decision–making skills in the future. While electronics are alright in moderation, it’s best to avoid overusing them and substitute them with traditional books and toys. Do you have any of your own tips to share? What has worked for you and your family? We’d love to hear your thoughts and ideas below! With all honesty, my son used to be hooked in his tablet. We thought at first, it was helping him to learn fast because he memorized a new kid song each day he learned to speak English very well. Later on we kind of notice that he was getting too much hooked with it that each morning when he woke up until bedtime at night he never let go of his tablet. So we decided to change the habit and the first plan was to let him watch toy cars in you tube and let him know how to play it. Then we bought him toy cars and from then it gradually turned most of his attention to it. Luckily, I would say he spends most of his play time with his toy cars and other kids stuff like coloring book. He still watches online children video until now but not as much compared to what it was and I know for sure we are going to keep it that way. That’s a great tip, joey! Thank you for sharing it. It’s truly difficult to wean a child away from gadgets and we truly need to be creative so we don’t end up fighting with our kids to let go of the habit. I’m grateful for this insightful article on how we can combat the effects of gadgets and battery powered toys on our kids. One good thing is that taking them to doing some things by themselves is a perfect way to make the toddlers to be creative. The damages phones and TV programs have done to the development of our kids can’t be overemphasize and it’s great you gave out tips on how to remedy such situations and give them better ways to develop. Yes, if we truly think about the lifelong side effects of gadgets, it’s going to wreck havoc in the teen to adult lives of our children. One of the obvious/immediate side effects is on their eyesight. They tend to have poor eyesight at an early age as compared to people who grew up not exposed to gadgets. In the old days, poor eyesights are caused by old age but these days, exposure to computers and gadgets seems to be the main cause. To Much gadget can damage the brain and the eyes of a child .. I was read an article also of a baby has a seizure because of using too much gadget ..like tablet. In a modern days we need to be responsible parent to our child. Me as a mom i give my time to my children although im busy to my business. Sad to hear of a seizure case due to gadgets. Reports do indicate that there are such cases although experts still need to establish if gadgets are the actual cause. Still, it is best to be careful and to control kids’ use of the device. Better be careful than be sorry. The honest truth is that this new age has ushered us into some type of new parenting norm. Combating the use of electronic gadgets on kids is almost an impossible task in recent times. But I still think it Can be achieved through the majority if means mentioned in your post. Amongst all points listed out in the post, I think point number 10 is the best of all. Trusting your toddler gives a little more room for some sorry of responsibility to hang on their shoulders. No child will want to loose that feeling with their folks. I agree with you on your thoughts about how parents should in someway trust their kids to a certain level though I still think control should be a part everything they do. Gadget control on the other hand can be a very difficult thing to do. This modern age has really brought a new type of of norm in our society. Even if we are able to control it at home, kids will somehow find a way around it outside the house. Gadget control won’t be an easy thing to do at all. You sure know how to make some kind of articles, I really encourage you to do more and more, because you are teaching us how to be better parents for some of us who are not yet ones and to also be good parents for those who are. Social media have cause an interference into the average family life, the effects can be seen in the evidence of the high rate at which divorce have sky rocketed in the society, asides that it has caused a whole lot of unhappiness in the familiesphere. Social media era has brought about unhappy kids this is evidently shown in the way family relationship and ties with kids have gone astray, firstly when putting this kind of law or trying to get your kids to follow the ban on social media or restrictions you have to make sure that you as a parent is not doing that, parents nowadays can’t put their phone down to have a real chit-chat with their kids this is really sad. I like all your directives and I hope parents see this and try to make it much better like putting all these you said into work. Thank you very much for the heartwarming feedback. We truly appreciate it that our efforts are helping parents-to-be and parents to become more effective in their roles. Indeed, a lot of parents are too busy these days and take their kids for granted. We do need to remind them from time to time about the importance of giving time and attention to children. I have also read that too much of tablets may replace the hands-on activities important for the development of sensorimotor and visual-motor skills of the young child, which are important for the learning and application of maths and science. In our country, a few months ago a couple of children suffered in aneurysm and it is said that the main cause is too much exposure to radiation of smartphones and gadgets which is pretty scary and we don’t want to happen to our child. That’s true. If a child does not have hands-on activities or physical activities, it could pose a health risk for him/her. Studies indicate that the lack of physical exercise could negatively affect “cardiovascular, metabolic, and musculoskeletal health,” as well as academic performance. If we look at the negative effects of using too many electronics or gadgets where babies are just growing up, it’s worth taking certain steps to ensure that restrictions are placed. Exposing little babies to the the use of remote controller, computer mouse, or any other similar tool can draw particular attentions and create some bad exposure. Some babies grow with games. Some of these games are downloaded games and others are video games bought directly from stores. All these influence the growth of a little baby and may affect her in the way she talks or reacts to certain things in life. Yes, the control is always on the parents. No parent should expect a child to put down his gadget and play physical games instead. This is rare, and only when the child sees other interesting physical activities. If this does not happen, parents should not rely on gadgets as their child’s sitter. As a children author myself, I see the importance of books for children. First of all, books will encourage reading habit, which is very good for learning. Secondly, books will not damage kids eyes just like tablets and TVs. One of the great things about allowing kids play with toys is they will begin to imagine things, they will create stories. This is very helpful in making them creative. Technology is good there is no doubt about it but is it good for toddlers at such young age? I would that the answer is Yes and No together. It’s a yes meaning that there are so many educational movies and lessons one’s toddler can learn from and remember the power of video over written text. But the No comes in where there are so many other immoral things a child can seen in television or using the tablet unless the parent would censor what the child have access to. So therefore, I would go with the orthodox means of books and toys for the toddlers.